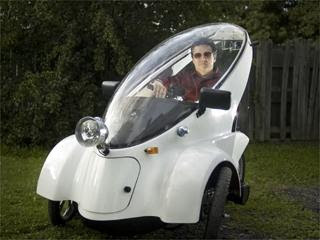 BugE - More than a bike, less than a car: Auburn NY Newspaper features the BugE! This was the color photo that went with the newspaper article. One major change from the plans is that big ole headlight that New York State insisted upon. I also replaced the Eurosport mirrors with larger pickup truck mirrors that work much better. Because the turn signals are not built into the new mirrors, I have added some K&S DOT approved blinkers for the front. The tail light and rear turn signals have been upgraded with lights that have clearly marked DOT markings on it. I went through the receipts so the inspection people have something to base sales tax on. The major component cost came in at $7200. The kit can be built for less. However, my vehicle has some optional features that drove up the price. For example, I added more wiring for reverse, a Powercheq battery management system, a dc-dc converter with more capacity and a seat slider. This amount doesn't include all the fiddly bits such as nuts, bolts, connectors, paint, tools and materials I used from previous projects. It also does not include the special journeys to the store I made when I was short a bolt or two. The true cost also includes upgraded parts not used, excess materials not used, some new tools plus a nice tool chest to keep them in, garage floor refinishing materials, painting supplies, respirator cartridges, small shop vac and even a trailer hitch installed on my OTHER car so I can haul the BugE around! Plus, it also includes a cycle shelter to keep it in. This much larger total came to around $12k. However, these things are not "in" the car. So, when people ask, how much did it cost for my little adventure (or rather how much would a new BugE really cost for them) it depends. Of course, my labor isn't counted in this total either. But hey, it's my first attempt at putting together an electric vehicle. Given how much a custom motorcycle can cost I think I did quite well! I've also saved up enough money to go the next step which is to register and insure it. So, I've filled out the paperwork to get a VIN. The packet came with a form that explained what I needed to do. I needed to send some paperwork to Technical Services and a multi-copy form (with a check) to the field investigation department. Obviously, NY-DOT hasn't inspected very many electric motorcycles. Some fields such as "fuel type" could be filled in by "electric" and it makes sense. However, other fields such as "displacement" are rather tricky. So, I just put in 150CC and then a side note that it was just a guess on equivalent power. I also had to loosen the motor clamp to read the motor serial number. I found out I have number 701. The weight field I left blank since I was informed by my caseworker that I could provide the weight upon registration rather than make a special trip to a NYS approved weighing station just to fill in the blank. So, I gave an approximate weight of 400lbs with batteries just in case they need a ballpark figure for some reason. Along with the form, I need to send copies of receipts for "major components". So, the packet I sent off was quite large at that point. Now, it's time to wait. Since the request is being shared between two state offices, I'm expecting quite a long wait. I just hope I can get the vehicle registered before December 31st so I can qualify for the Federal tax break. Given that it's September, and it's New York State, I'm thinking I'm cutting this awfully close!